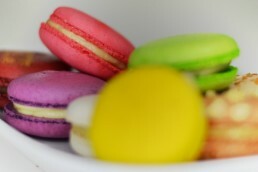 Flavours & colours to suit everyone's tastes! The amazing texture that is a macaron, and in a variety of flavours - our hand made selection can make the perfect coffee accompaniment or the centre piece of a party! Available in Dark Chocolate, Pistachio, Strawberry, Salted Caramel and Vanilla.